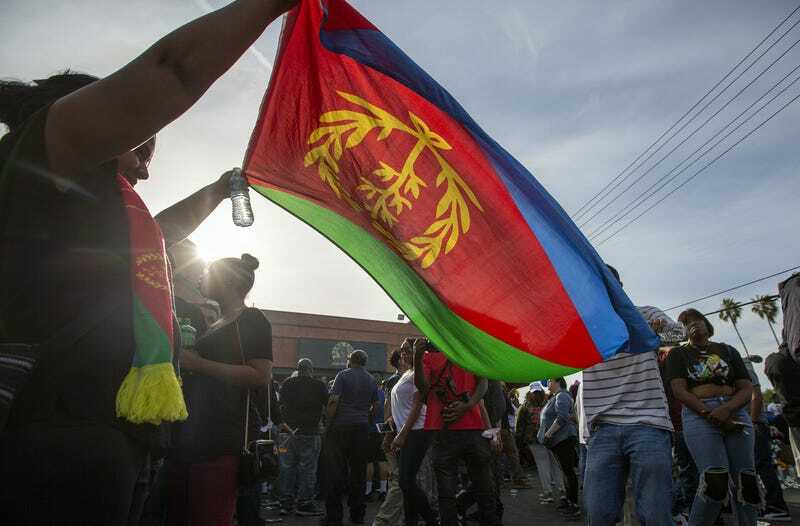 Nipsey Hussle fans wave Eritrean flag during vigil for him in Los Angeles April 1, 2019. He became famous as Nipsey Hussle, but he was beloved as simply “Ermias” among the Eritrean-American community Hussle proudly embraced as the child born Ermias Asghedom to Eritrean and African American parents. Members of Los Angeles’ Eritrean American community gathered to remember Hussle during a memorial service Sunday at the Medhani-Alem Eritrean Orthodox Tewahdo Church in South Los Angeles. Eritrea is located in East Africa, a tiny nation—population just over 5 million—that won a hard-fought, decades-long war for independence from Ethiopia, begun after the former Italian colony was annexed by Ethiopia during the 1960s. Hussle’s father, Dawit Asghedom, came to Los Angeles in the 1970s during one of the first waves of Eritrean immigration there, and met and married his mother, Angelique Smith, who is African American with Louisiana roots. The couple divorced in 1987, according to the Times, but Hussle grew up exposed to Eritrean culture, and he openly embraced his heritage, visiting the nation for the first time in 2004, reports the Washington Post. After Hussle was slain by a gunman’s bullets outside his Marathon Clothing store in Los Angeles, Eritrea’s minister of information, Yemane G. Meskel, offered condolences on Twitter, the Times reports. More than 40 vigils to Hussle have been organized worldwide, and the Eritrean community from coast to coast in the U.S. have held candlelight vigils. Sunday’s service in Los Angeles at the Medhani-Alem church drew hundreds of people. Prayers were said in Ge’ez and Tigrinya, Eritrea’s national language. Young mourners following the service pledged to continue the work of community building, entrepreneurship and philanthropy that Hussle embodied.